Well, this post was meant to come right after the Worlds, but laziness took over and now here we are. 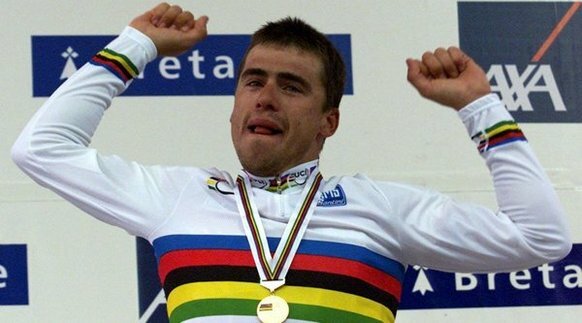 Anyway, during this year’s Worlds there were, as ever, stories and announcements about the future of the UCI’s crowning glory. Here’s a look at the news that came out about the future World Championships. We saw the unveiling of next year’s route – the 2013 Worlds in Tuscany. The week will begin on Sunday with the women’s and men’s TTT (36.1km and 50.3m respectively). The 23.1km women’s ITT follows the next day, with the men’s 55.5km ITT running from Montecatini Terme to Florence on Wednesday. The day after the men’s ITT, the UCI Congress is held, with the election of a (hopefully new) President the same day. On Friday, the 130km women’s Road Race will be held, with Sunday seeing the 267km men’s route, from Lucca to Florence. The men’s road race starts in Lucca, taking in the Provinces of Lucca, Pistoiese and Florence. 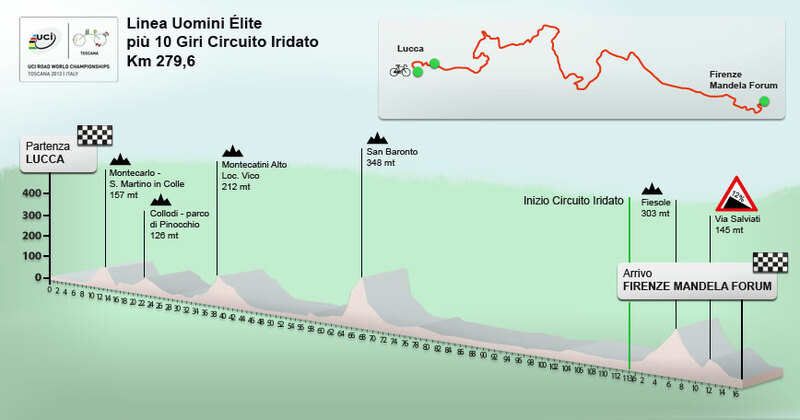 The race begins with a couple of small hills (including a climb up to the Parco di Pinocchio in Collodi). The tough-looking lump midway through is San Baronto, a hill which is part of the Montalbano ‘mountain’ range. The climb is 4.1km long from Lamporecchio with an average gradient of 6.8%. The hill was used in the 2005 Giro, with Koldo Gil taking the win, and is used in the GP Industria & Artigianato di Larciano. Thereafter follows a long stretch of flat as the race heads to Florence. Once there, the route takes in the river and the famous cathedral before ending up at the Nelson Mandela Forum, the sports arena near Fiorentina’s home ground, the Artemio Franchi. Ten laps of a tough circuit will finish things off – taking in the Fiesole climb (7%+ for the last 1.5km) and two smaller lumps before finishing in the same place. It definitely looks to be one for the puncheurs, with ten times up the Fiesole certain to see the sprinters dropped. Another version of the route profile can be found here, with a map here, and a MapMyRide route of the course up to the finishing circuit here. I didn’t intend that to be a full preview of next year’s Worlds, but there we go. Less work next September I guess. Onwards to 2014 then. 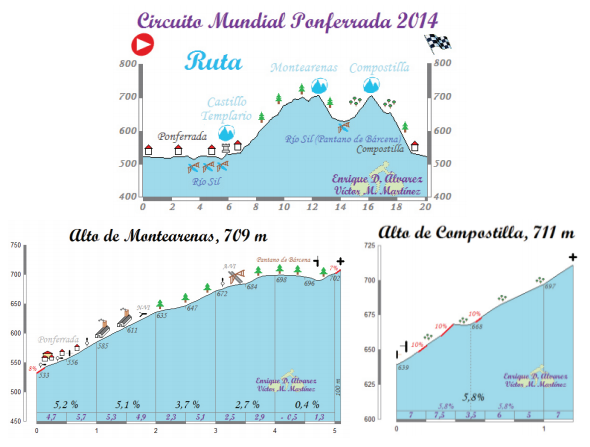 The Worlds has been awards to Ponferrada in Spain, with a very tough course expected. However, there have been money problems, with Ponferrada City Council needing to find €5.5million by October 19 or the UCI will have to locate a new host. At the end of last month it was reported that they had already begun the search for possible replacements, with France, Belgium and Bergen in Norway being looked at as candidates. Just for completion, here are the probable routes for the time trial and the road race circuit. As I said very tough. Thanks to issue 4 of Desde la Cuneta. With courses like that, lets hope Ponferrada can get the money together. Lets ignore the 2015 Worlds for now, partly seeing as there hasn’t been any news relevant to it lately, and partly due to the nepotism involved in awarding the Worlds to that cycling hotbed of Richmond, Virginia. Pat McQuaid’s brother Darach worked as an advisor to the Richmond bid. In addition to that, Pat’s son David is Santini’s (yes, the same Santini who have an exlusive contract with the UCI to manufacture the Word Championships jerseys) importer to Ireland. His other son, Andrew, is an agent who represents Nico Roche, Taylor Phinney, and others. So yeah, here’s 2016. Qatar. The 2016 World Championships will be held in Qatar. Yep, the world’s wealthiest country (per capita). The country has hosted a successful (though hardly exciting) race, the Tour of Qatar, for ten years now under the control of the ASO. We will have to wait and see what can be done for the Worlds course there, but in a totally flat country it doesn’t look as though we’ll be in for a vintage edition. Add that to the fact that the Tour of Qatar doesn’t tend to attract large crowds. Does globalisation mean going where the fans are, or where the money is? The UCI have, sadly, already answered that, expanding into China and the Middle East while neglecting Africa and South America. There has, however, been speculation that artificial hills might be built specially for the race, with the UCI Sport and Technical Director Philippe Chevalier saying “The management of the Qatar candidature presented an extremely interesting project which incorporated innovative solutions which allowed for the designing of a technically interesting course, we are greatly looking forward to working with them.” It might sound pie in the sky, but with the huge budget of the oil-rich state, it can’t be ruled out. It will be interesting to the the UCI Financial Report after Qatar’s payment to the UCI goes through.